We’ve spent years ferreting out the stories of the common sailors who served on board Constitution during the first decades of the nineteenth century. We consider it no small victory when we find a brief mention of them in a letter, a pension application, prize money voucher, or some other taciturn government document. Imagine our glee, then, when we find documents that not only give us a glimpse into the life of a particular sailor, but also tell us something of his character and language. In his defense, McClarey claimed that he had once lived as a clerk with a Mr. Fundy in Albany, NY, but had left his employ after being severely beaten in the head. One of his shipmates, Ordinary Seaman Killian Bogart testified that he’d seen McClarey wandering the streets of Albany “apparently crazy” three years since. When he asked the witness, “do you recollect my ever having told you that on account of a wound in my head, I was subject to fits of Insanity,” Bogart replied, “you have frequently told me, that owing to a wound in your head, you were subject on taking the least liquor to fits of Insanity.” Loring lamely offered nearly the same defense. 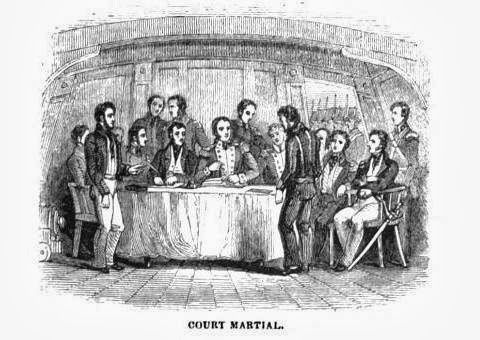 Not surprisingly the court (composed of officers Charles Ludlow, Oliver Hazard Perry, Charles Morris, George Cambell Read, and Thomas Gamble), found the prisoners guilty of the charges and sentenced them both to receive 100 lashes on the bare back with a cat-of-nine-tails, a punishment that was carried out on board Constitution at 11 AM on February 25. Loring stuck around long enough to be discharged at Boston on May 6, but McClarey, hugely disgruntled with the service, deserted on May 13. Records of General Courts-Martial and Courts of Inquiry of the Navy Department, RG 125, National Archives. The trial was held on Feb. 22, 1811 on board USS President in New London, CT.